Step up to BIG! The Toyota Sequoia is a rolling fortress of an SUV built on the chassis on the Tundra pickup. With a pedigree like that, the Sequoia eats up the road as it travels, and can also give you all the benefits of a powerful pickup truck, namely carry eight passengers and tow a few tons at the same time. You really have to drive the great new Sequoia to appreciate its dual personality – half luxury SUV, half chompin’-at-the-bit pickup truck. To see the new Sequoia in its best light, hurry down to Vann York Toyota in High Point, NC, and see this majestic, full-size vehicle for yourself. Vann York Toyota is one of the biggest auto dealerships in the area, so we have one of the biggest selections of Toyota Sequoias you’ll find anywhere. We’re situated at 500 Eastchester Drive in High Point, and we welcome customers from Greensboro, Winston-Salem, Kernersville, Jamestown, Thomasville, Lexington, Asheboro, and Burlington, NC, and anyone else who wants a great SUV at a great price. Raise your hand if you’ve towed anything behind your vehicle in the last two years…trailers, boats, other vehicles or other heavy loads. If so, you’ll really appreciate Sequoia’s commanding 7,400-lb towing capacity. It makes it easy to bring along an ATV behind you in tow for those adventures within adventures. You know sometimes when you’re towing a load and a gust of wind makes the trailer sway, and all your passengers see their whole lives flash in front of them? You won’t have to worry about wind gusts or load shifts as much with the Sequoia’s Trailer Sway Control (TSC), which automatically applies brake pressure to each wheel individually to correct sway. For hauling boats or U-Haul trailers over hilly areas, this rugged traveler’s TOW/HAUL mode optimizes the transmission performance and engine power. Clearly, this handsome full-size SUV can take whatever you throw in front of it, or behind it. From bumper to bumper, the 2016 Sequoia was designed with safety in mind. The Advanced Airbag System gives you dual stage airbags, seat-mounted side airbags, and the latest in life-saving technology – Roll-sensingSide Curtain Airbags for all rows. On the outside, daytime running lights make your regal Sequoia stand out 24/7, and a blind spot monitor uses radar to check your blind spots and assist you in changing lanes. 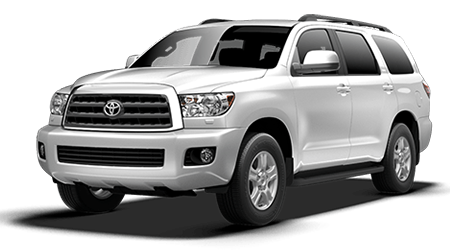 If you want to see the 2016 Toyota Sequoia in all its glory, you’d be wise to visit Vann York Toyota at 500 Eastchester Drive in High Point, NC, for a close look and a test drive. Our new showroom is a relaxed, modern facility where the knowledgeable staff is eager to please. Vann York Toyota in High Point has become a destination dealership for discerning consumers, so don’t hesitate to visit us from Greensboro, Winston-Salem, Kernersville, Jamestown, Thomasville, Lexington, Asheboro or Burlington, NC, because we’re here to serve you better.